These utterly tone deaf messages underscore the problem of hiring social media gurus who don’t maintain their basic civic obligations to follow the news. 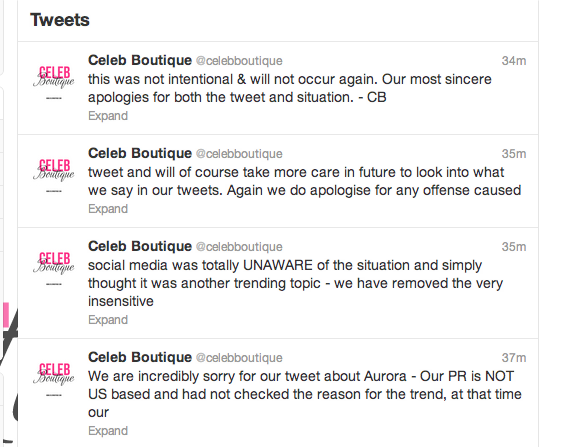 To Celeb Boutique, the backlash was severe. Tweets with the words “disgusting,” and “idiot” began trending in my Twitter feed, immediately after the message went out. We’ve included a few more below. The NRA, too, had its brush with stupidity (mentioned above), but was keen enough to take the tweet down and issue a statement, saying that the message was written without awareness of last night’s shooting. This isn’t the first time a business has regretted a tweet. “Millions are in uproar in #Cairo. Rumor is they heard our new spring collection is now available online,” wrote @KennethCole. So, note to social media marketers: keeping up with the news of the day is a requisite to your job. As with our previous story on this topic, our hearts go out to the victims of this tragedy and their loved ones. Please respectful in the comments (and to the unfortunate PR people in this email) as we discuss the role of media in national crises.